Jonny Gray has recovered from injury to play for Glasgow Warriors in their historic PRO14 clash against Toyota Cheetahs in South Africa (pic: SNS Group). Fit-again Jonny Gray will play his first game of the season for Glasgow Warriors in their historic first Guinness PRO14 match against the Toyota Cheetahs in Bloemfontein tomorrow evening, with head coach Dave Rennie saying the lock’s physical presence will be key. The Scotland international has recovered from surgery on his wrist and will partner Tim Swinson in the second row for the ground-breaking fixture. Gray’s inclusion is one of a host of changes made by Rennie following last weekend’s victory over Benetton Rugby. Fraser Brown returns to the starting XV. having recovered from his ankle injury and Jamie Bhatti and Zander Fagerson both return to join Brown in the front row. Captain Ryan Wilson once again starts on the blind-side and Adam Ashe and Callum Gibbins both come back into the team at No. 8 and open-side respectively. Ali Price and Finn Russell are the half backs. Outside of them, Sam Johnson wears 12 having secured a bonus point for the Warriors last weekend with a try deep into injury time. “It’s great having Jonny back. He’s been working hard for a lot of weeks jumping out of his skin, so we’re excited to have him in there,” said Rennie. “With Jonny and Fraser back it gives us more experience on the field and they both bring a lot of physicality, which is going to be important against the Cheetahs. “The Cheetahs can play a couple of different games. They have a big pack who can maul well and they have some real gas out wide, so they’re prepared to play. Price doesn’t think that playing at an altitude of 1400 metres will cause the Warriors too many problems as the squad has acclimatised well since arriving. The match will be screened exclusively live by BBC Alba (kick-off 7.35pm) and Price said: “We did a session yesterday afternoon when we had more prolonged periods of play. Ali Price promoting BBC ALBA’s live, exclusive coverage of Warriors’ first PRO14 fixture in SA v. Toyota Cheetahs (Pic: Cornel van Heerden /SPORTZPICS). “It is slightly different, you lose your breath a bit quicker but what we soon realised is that you recover quickly. I feel we are in a good spot. The training will help in the game. Replacements: J. du Toit, O. Nche, J. Coetzee, R. Bernardo, J. Pokomela, S. Venter, N. Lee, L. Obi. 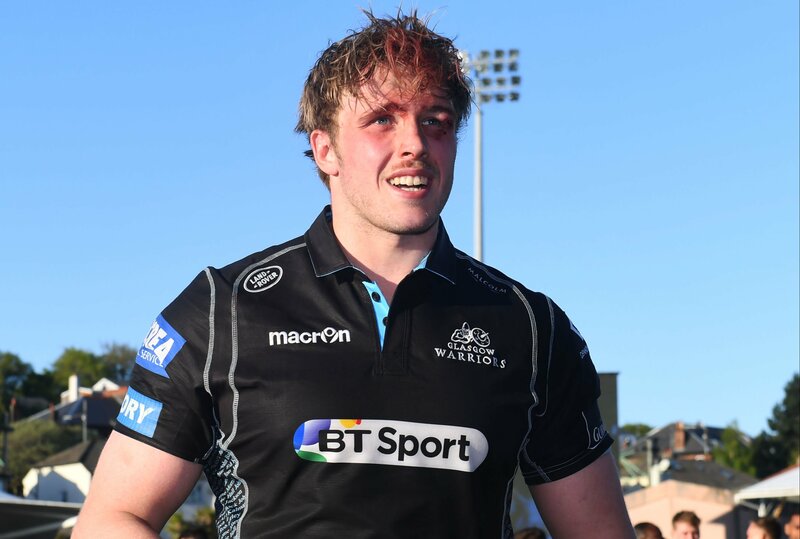 Glasgow Warriors: R. Jackson, T. Seymour, N. Grigg S. Johnson, L. Sarto, F. Russell, A. Price, J. Bhatti, F. Brown, Z. Fagerson, T. Swinson, J. Gray, R. Wilson (capt.) C. Gibbins, A. Ashe. Replacements: G. Turner, A. Allan, D. Rae, B. Alainu’uese, R. Harley, H. Pyrgos P. Horne, N. Matawalu.